I have noticed that book storage can be one of parents biggest organizational problems. They spill everywhere and are hard to organize because they come in so many different shapes, sizes and thicknesses. Books are no different than toys in their need for weekly rotation and enticing display. There may be a couple favorite books in the home, but most will need to be refreshed weekly and displayed in a way that children can easily see their covers and not just their bindings. 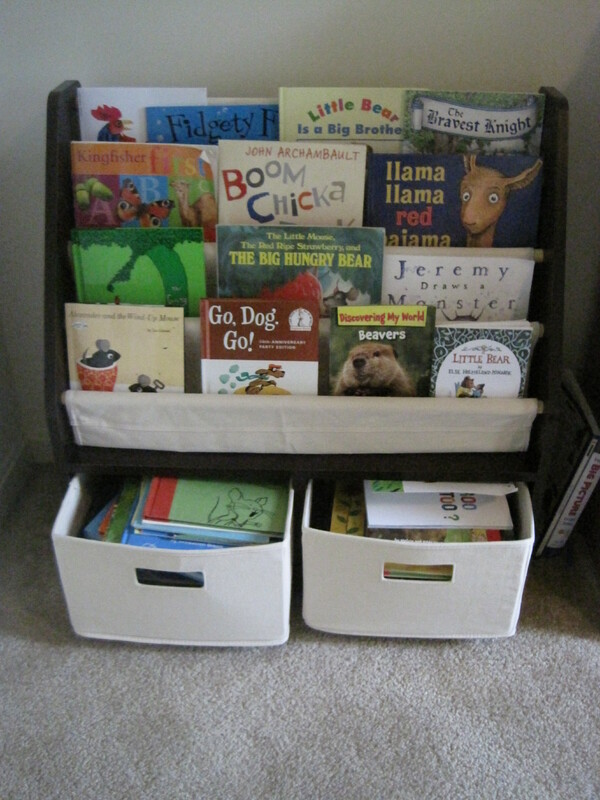 This particular book case, made by One Step Ahead, is sturdy and inexpensive, making it one of my top recommended products to parents. There are three display shelves that allow you to place the books facing out so that a non-reading child can easily see the cover pictures to identify the story. Displaying toys and books for a child is very similar to displaying products in a store. If you can entice a passerby-er to pick up a product, chances are you’ll have them hooked. Reading, independently or with an adult is very important, but children won’t always think to choose activities with books unless they are easily accessible and spur curiosity. The two drawers below the display shelves enable quick and easy rotations. Once a week, open a drawer, empty its contents onto the floor, place the books currently on display into the drawer and select new books off of the floor to place on display. Next week, choose the other drawer to replace the books. Children love helping with this job and will usually be very excited about choosing and displaying their books for the week. Quick, easy and inexpensive. I give this product 5 out of 5 Nests! Perfect for a bedroom or play area. Please follow this link to see the product on it’s vendor’s website: http://www.onestepahead.com/catalog/product.jsp?productId=538393&cmSource=Search . Also, note that One Step Ahead usually offeres deals for free shipping and other discounts. Check http://www.retailmenot.com for coupon codes before purchasing.